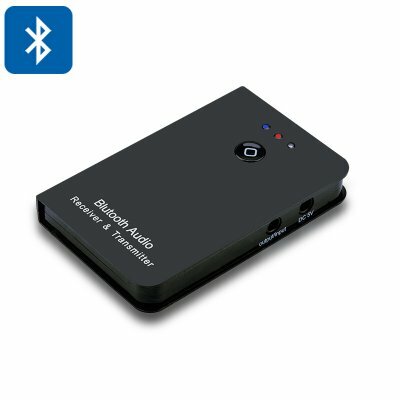 Successfully Added 2 in 1 Bluetooth Stereo Audio Receiver + Transmitter - For Speakers, TV, Mobile Phone, MP3 Player to your Shopping Cart. If you are still trying to figure out which type of Bluetooth adapter suits you best, this unit is the correct choice to help you out. The functions of this transmitter and receiver are so strikingly and seamlessly integrated into the unit that your audio enjoyment will meet superb enhancement and will never be the same again. Using this matchbox-size unit is just as easy as pie. The transmitter mode and receiver mode are simply one-button switchable. This is no doubt a superlative unit you can always rely on in terms of overall performance, standby time, working time and other metrics. You can change freely between transmitter and receiver as there is a switch labeled RX and TX. This product is in stock now, we guarantee next working day shipping and offer a 12 months warranty on all our products. Brought to you by the leader in electronic devices and wholesale Home Theaters, Chinavasion.